Whyteleafe suffered their first home defeat of the season against an enterprising Haywards Heath side. Leafe fought back from 2 down to level the game but suffered heartache in the closing stages when the hard work was undone by an unfortunate own goal. The visitors got off to an excellent start when they took the lead in the 8th minute when a fine run down the right by Kieran Rowe saw his cross find Andrew Dalhouse in the box, and his well placed header went in at the far post. 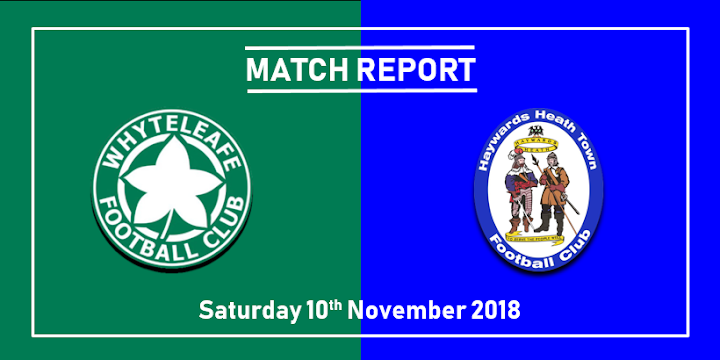 Leafe came back strongly at Hayward Heath, and their defence nearly presented them with a 26th minute equaliser when Bentley Graham was presented with the ball on the edge of the box but he shot just wide of the target. A minute later Eddie DSane won the ball on the left, beat 2 defenders and hit a low shot inside the near post forcing a good save from Joshua Heyburn. Dalhouse had a chance to score his second when put through in the 32nd minute but Corey Holder made a great saving tackle to deny him. 3 minutes later the same player found himself clear again following a great ball from Karl Akehurst, Tyler McCarthy was alert to the danger and was quickly out to smother his effort. Leafe had one further opportunity in the first half when Marvin Armstrong made a good run towards the penalty area, but his shot was too high. Byron Napper increased the lead in the 49th minute when he played a neat one two with Akehurst before striking the ball home. Leafe then had a fine spell with the substitutes prominent. Harrison Carnegie made some great runs on the right wing and in the 55th minute, cut inside to the box and struck the ball firmly into the net. Carnegie, who had come on at the interval transformed the game and was behind most of the chances Leafe created. In the 60th minute another good run down the right and a fine cross saw firstly Laurie Chin having a shot blocked, and DSane following up also saw his effort blocked. Scott Day was then introduced into the attack, adding another dimension to Leafe's game. He had a header from a Bradley Wilson free kick tipped over by Heyburn, then 2 minutes later headed over from another fine Carnegie cross. Leafe finally equalised in the 77th minute when DSane's cross across face of goal was met by Scott Day at the far post, scoring from close range. Leafe continued to push forward in search of a winner and although they were creating chances, the visitors were looking dangerous on the break as Leafe left gaps at the back. All Leafe's hard work was cruelly ended for nothing in the 86th minute when Dan Hector's attempt to head a cross away to safety went into his own net to give the visitors victory. Whyteleafe Team: McCarthy, Wilson, Akongo (Carnegie 45), Campbell, Thompson, Holder, Hector, Graham, D'Sane, Armstrong (Chin 45), Williams (Day 67). Subs not used: Orome, Hattabi.